Crossing international borders by air is usually an efficient process. Just line up, hand your passport over, smile politely and wait for your exit or entry stamp. Oh, were it that simple to cross by land. Our trip across the frontier at Khorgos took most of the day and a most of my patience. When we initially showed up at midday, we were informed that the border was closed for lunch and wouldn’t reopen until 3PM. Yes, apparently international trade plays second fiddle to the stomachs of the Immigration and Customs Service. So we retired to a nearby park, well away from the hawkers and money-changers, and waited for the reopening of the border. At 3:00 we were finally allowed to proceed through the security gate, though it was a further 30 minutes before the actual border opened. It must have been a hell of a good lunch. Eventually Jared got inquisitive about all this random inquisition and went for a wander. We could see right into the office where the immigration officials were working, and he noticed that one of the officials was not just inspecting our papers but was making hi-resolution scans of Katie’s Connecticut drivers license, and also of the security holograms on our passports. Most unusual. From what we could gather, the bored officials had been using our passports and the license, all exotic and unfamiliar to them in this lonely corner of China, as a teaching tool while we sat and twiddled our thumbs. After a polite but firm protest from Ms. Tibbetts and veiled threats of calls to embassies if we were detained much longer without explanation, our passports were returned – without explanation – and we were allowed to line up at the ACTUAL immigration check, where they were verified by computer in less than 30 seconds. Goodbye, Chinese officialdom. The next problem was crossing no-man’s-land. Apparently this was not permitted by bicycle. “Can’t we just ride across?” I inquired of one of the officials, a rather helpful gent who’d been chatting to us while the earlier farce played out. I was still rather keen to give it a shot, but as I’d neglected to pack my Kevlar jacket, I consented to try it his way. None of the minibus drivers would entertain the thought of four bikes and riders, at least not at the regular 20 RMB (2 pounds) rate. One stetson-clad Dallas reject ( I kid thee not) wanted over 100 RMB each, a rather steep fare for a measly 1km drive. Thankfully, we had an ally in our friendly Chinese official. He asked around and found a long-distance bus driver who not only agreed to take us across, but absolutely refused to accept a solitary cent in payment. A true gentleman. I regretted my earlier decision not to buy a high powered slingshot from the hawkers outside. We weren’t done with complications. As the bus left immigration and pulled up to the first of several checkpoints, a guard in a medical mask hopped aboard and did a headcount of the passengers. The total displeased him somewhat. Whatever the problem, he wasn’t happy and recounted three times before storming off. Either there was an extra passenger or one too few – I’m still unsure which- but we were ordered to reverse to the customs post and disembark. This, for some bizarre reason, took five attempts and a lot of corralling by the conductor and driver. At the fifth count, the missing/extra person was located. 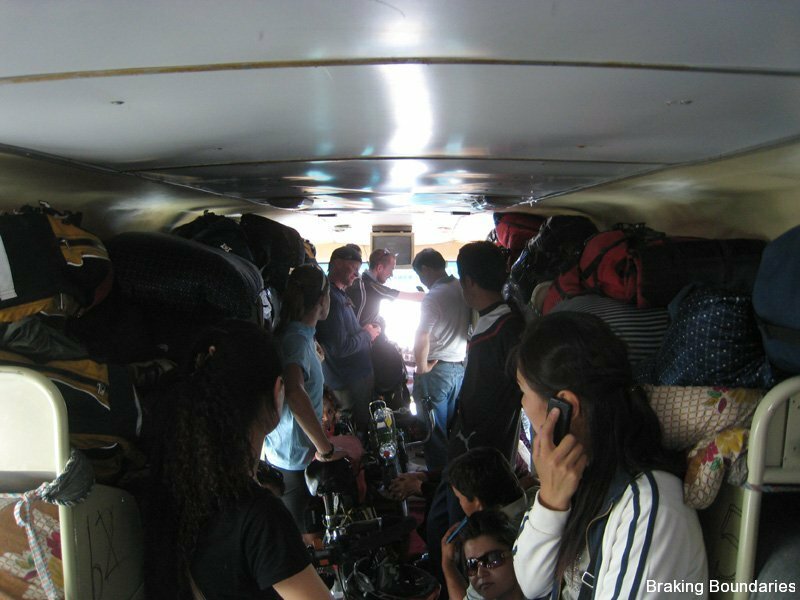 Then everyone crammed aboard again and we repeated the process, this time getting a favorable response from the border guard. On the Kazakh side, things passed rather more smoothly. 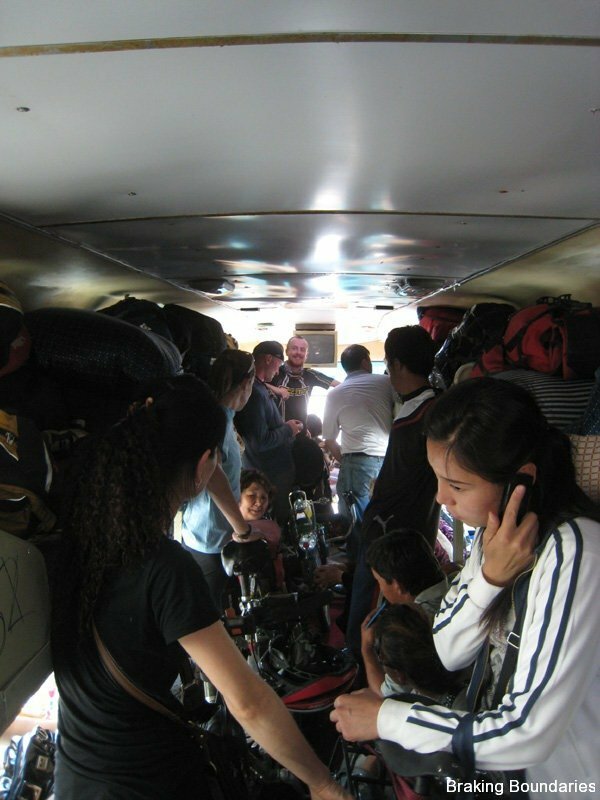 We got off the bus, loaded the bikes, and were quickly ushered through and passed though customs within 20 minutes. Welcome to post-Soviet freedom.